Saint Óscar Romero was officially canonized on October 14, 2018. 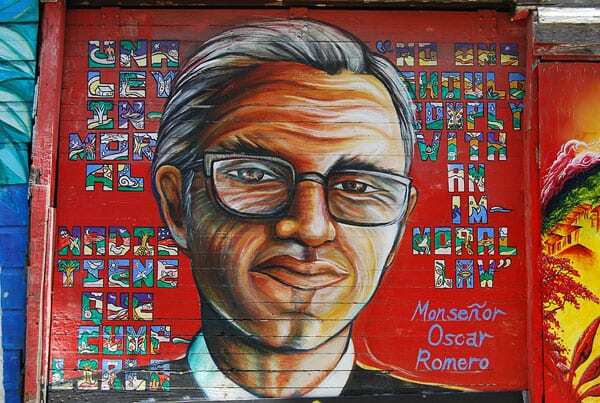 Since his assassination in 1980, Romero has been a patron saint for many who share his focus on the “preferential option for the poor” principle and his call for an end to their oppression. While he was officially canonized for a miracle involving the recovery of a pregnant woman in a coma, millions of people have revered him for years because of his devotion to the poor and his advocacy against the military dictatorship that was taking over his country. As Danny Sheehan, president and co-founder of the Romero Institute, an interfaith, nonprofit law and public policy center, put it, “We all have to become missionaries of the good news, the same good news that Oscar Romero was attempting to share with the world when he died.” Romero was shot while celebrating Mass in El Salvador, “by a death squad linked to the military dictatorship, who falsely believed that Archbishop Romero was supporting Marxist guerrillas because of his concern for the poor of his country,” according to the Catholic News Agency. Other namesake nonprofits in addition to the Romero Institute include the Christian Initiative Romero in Germany and the Romero Center Ministries in Camden, New Jersey. In 2011, the Romero Centre in Ireland organized the United Nations’ first International Day for the Right to the Truth concerning Gross Human Rights Violations and for the Dignity for Victims in honor of Romero. While saying Mass the following year, Romero was assassinated. No one has been prosecuted for firing the single bullet that ended his life until this week, when Judge Rigoberto Chicas issued the order to apprehend Alvaro Rafael Saravia. During his funeral, where more than 250,000 mourners gathered at one of the largest demonstrations in the history of El Salvador, an estimated 27 to 40 people died and more than 200 were wounded from gunfire and the subsequent stampede. The ceremony last Sunday morning in St. Peter’s Square in the Vatican featured seven new saints, but Romero was the most conspicuous. Though it was seen by some as a rebuke to his predecessors, who regarded Romero as being too far to the left for canonization, Pope Francis authorized Romero’s elevation and wore the bloodstained rope belt that Romero wore when he was shot at the altar. Three weeks after Romero’s appointment as archbishop, a priest and friend of Romero’s was murdered. The priest had been critical of the regime, defended the peasants, and had been active in helping to organize base communities. Romero traveled to the rural church where slain priest’s body had been taken, and during the funeral Mass called his death an assassination. Romero returned to San Salvador, closed all the country’s Catholic schools for three days of mourning, and then held a single Mass the following Sunday outside San Salvador Cathedral for all the city’s parishes. Romero declared that he would not participate in any formal governmental event until the assassins had been brought to justice. For the following three years, in his ­homilies broadcast over the radio and in the archdiocesan newspaper, Romero persisted. There is no justice without truth. Thirty years ago, Deaf students at Gallaudet University, a school that has served the hard-of-hearing for more than a century, stood up to demand a Deaf president. The action has become a celebrated marker in the movement for Deaf community self-determination.